Aurora Texas, and Aurora UFO incident. Settlement of the area began in the late 1850s. The pastoral beauty of the place impressed a man named William Stanfield enough to name it after the Roman Goddess of Dawn. The town became a trading center for the first twenty years of its existence and a post office was granted in 1873. Within 10 years Aurora could boast two schools, two hotels, two gins, and a population that may have been as high as 3,000. 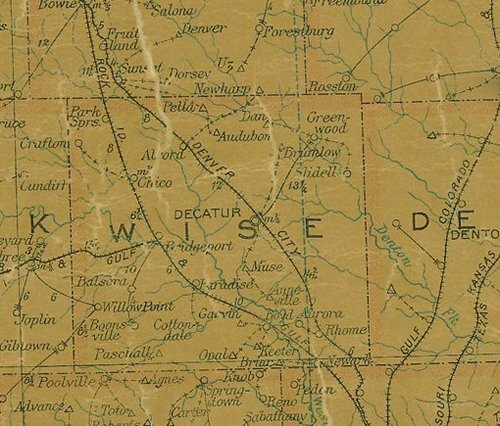 A spotted fever epidemic in late 1888 practically evacuated the town by 1889 and the Fort Worth and Denver City Railroad which was due to arrive in 1891 chose nearby Rhome for their depot instead of Aurora. The town was heading downhill fast. 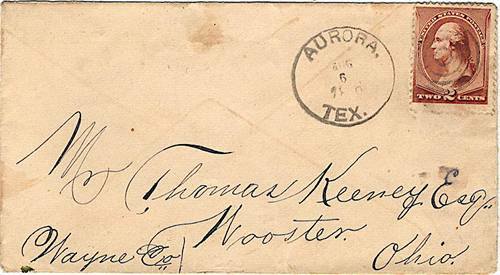 By 1901 postal service was rerouted and the Aurora post office closed. It might have become a ghost town if not for the 1939 construction of State Highway 114. 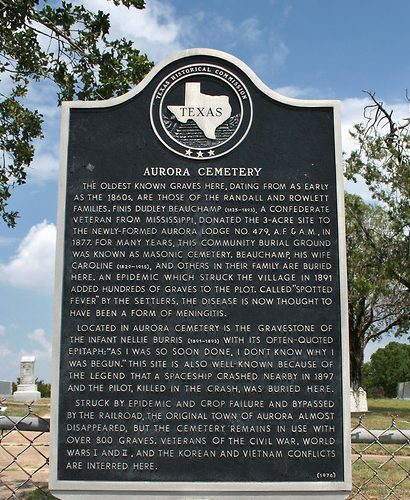 Aurora today still retains the rolling terrain and the picturesque cemetery is just south of the highway � just follow the signs. 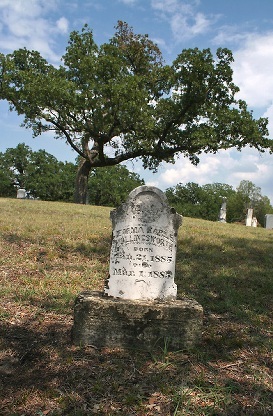 The oldest known graves here, dating from as early as the 1860's, are those of the Randall and Rowlett families. Finis Dudley Beauchamp (1825-1893), a Confederate veteran from Mississippi, donated the 3-acre site to the newly formed Aurora Lodge No. 479, A.F. & A.M., in 1877. 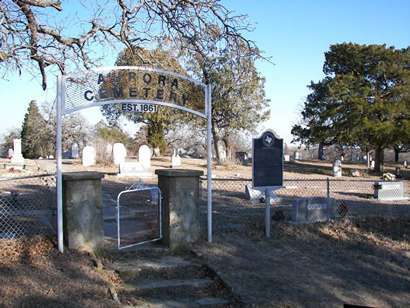 For many years, this community burial ground was known as Masonic Cemetery. Beauchamp, his wife Caroline (1829-1915), and others in their family are buried here. 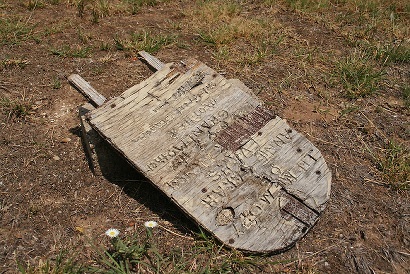 An epidemic which struck the village in 1891 added hundreds of graves to the plot. Called "spotted fever" by the settlers, the disease is now thought to have been a form of meningitis. 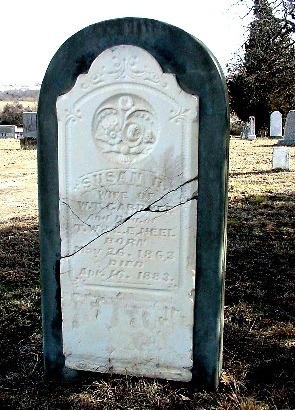 Located in Aurora Cemetery is the gravestone of the infant Nellie Burris (1891-1893) with its often-quoted epitaph: "As I was so soon done, I don't know why I was begun." This site is also well known because of the legend that a spaceship crashed nearby in 1897 and the pilot, killed in the crash, was buried here. 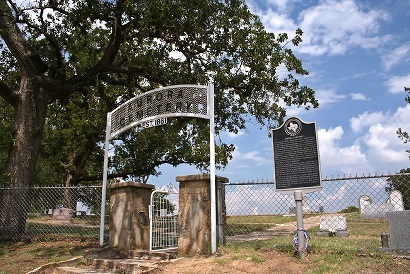 Struck by epidemic and crop failure and bypassed by the railroad, the original town of Aurora almost disappeared, but the cemetery remains in use with over 800 graves. Veterans of the Civil War, World Wars I and II, and the Korean and Vietnam conflicts are interred here. I am the great-great-great granddaughter of Finis Dudley Beauchamp. 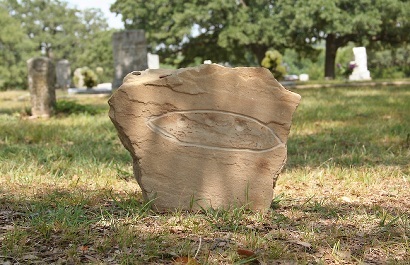 Dudley is the person who donated the family cemetery to the town of Aurora. My great grandmother, Robbie Reynolds, was the 91 year old person that so many of the online articles mention as having been interviewed in the 1970's. As much as I wish the whole story were true, the fact of the matter is, it's not. My great-grandmother and I were very close. She said that the whole story was a hoax, and the original interview included that. I'm not sure how the story went from her saying it was a hoax to the story that her parents went to check out the situation, and wouldn't allow her to go. In your article you mention that most people of the time were illiterate. I know for sure that my great-grandmother and her mother and father could read and write very well. I also know that Robbie Townsend, the woman for whom my great grandmother was named, was a teacher.